One of the simplest ways to bring ambiance to your home is with the addition of fragrance. Votivo was founded in 1994 with the mission to bring unique and luxurious home fragrance items to the market along with beautiful packaging that looks attractive and makes for a lovely accent piece in any room. Votivo candles come in a variety of fragrances for any mood or taste and dazzle guests every time with their inviting scents and sleek designs. Votivo aromatic candles make for wonderful gifts for any occasion. You can make your abode feel more inviting with the help of Votivo's home fragrance items. Mix up the scents for different moods, occasions and seasons. Exquisite candles and delicious diffusers can add a touch of glamour, romance or fun to your home. You can create a range of moods using the opulent scents within the Votivo collection. Established in 1994, Votivo applies a high quality standard to every candle, diffuser, and fragrance spray within its luxurious range. Pewter seals are hand-pressed and candles wrapped by hand in sumptuous tissue paper, making each item extra special. Whether you are purchasing a fragrance for your own home or buying one as a gift for a friend or relative, you can be confident that Votivo products will never disappoint. Meticulous craftsmanship lies at the heart of every Votivo candle, diffuser and fragrance spray. The key to a lasting fragrance is layering. By mixing scents in exactly the right combination, Votivo produces depth and complexity within its aromas. The top note is the initial scent that catches your attention. It consists of fragrances that evaporate quickly when exposed to the air. As the top note dissipates, it is followed by the middle note, which is the core of the scent. As the middle note fades, it is followed by the base note which gives the last impression of the aroma. When you are searching for an ideal gift for a friend, relative or work colleague, Votivo products are the ideal solution. The opulent packaging and luxurious fragrances will impress any recipient. Great care is taken when developing the scents that form part of the Votivo range. This means that only four new aromas are introduced each year. Enjoy the refreshing fragrance of Votivo Products by adding this line of candles and diffusers to your home. Featuring masterfully blended fragrances, Votivo Products entice the senses. Choose from an array of fragrances, from crisp white linens to citrus-inspired scents to rich red currant or Tuscan olive. Votivo Products are as aesthetically appealing as they are fragrant. Candles and reed diffusers come in attractive glass jars that feature the Votivo seal. Alternatively, you can take your refreshing Votivo scent with you by choosing a candle that comes in a convenient travel tin with a lid. Votivo Products are natural, and the line's candles feature a soy blend. Each candle is hand poured and can burn for up to 60 hours. Whether you choose a candle or a reed diffuser, you can enjoy a range of enticing fragrances that make your home a more welcoming place. Invest in a few different scents for different seasons, your family will thank you. Fill your home with refreshing, memorable scents with Votivo Products. Featuring candles and diffusers in a range of scents, Votivo Products blend in well with your home dÃ©cor in their attractive packaging. Whether you want to add an inviting scent to your own home or give a thoughtful, sure-to-be-appreciated gift, Votivo has the products that you need. Find a candle or diffuser in a scent that you love. Votivo Aromatic Candle Red Currant features the aroma of red currants with sweet vanilla and raspberry. 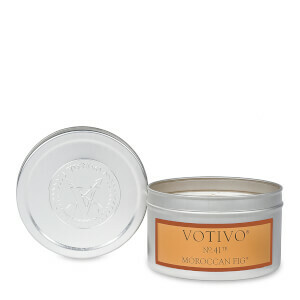 Enjoy this aromatic, hand-poured, soy-blend candle, which comes in a glass jar with the Votivo seal. The candle burns for 50 to 60 hours. 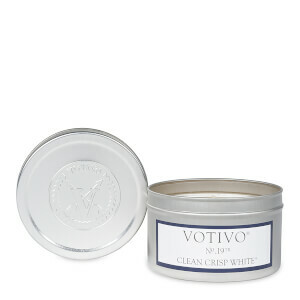 Enjoy the refreshing fragrance of Votivo Aromatic Candle Clean Crisp White, an aromatic soy-blend candle. This clean fresh scent will remind you of just-out-of-the-dryer linens. Votivo Aromatic Candle Glorioso features a green citrus scent with touches of wild violets, muguent, and amber, leaving your home smelling fresh. You can burn this aromatic, hand-poured candle for up to 60 hours. Bring the refreshing scent of citrus to your home with Votivo Aromatic Candle Island Grapefruit. As its name implies, this aromatic, soy-blend candle emits a juicy grapefruit fragrance. Enjoy this refreshing aroma for 50 to 60 hours. Votivo Aromatic Candle Tuscan Olive gives off the aroma of fresh-pressed olive oil with touches of sweet basil and oregano blossom. This candle comes in a glass jar with the hand-pressed Votivo seal, and you can enjoy its fragrance for up to 60 hours.